1. Simplicity: Cabinet Cooler Systems need compressed air to work. That’s it. Supply them with clean, moisture free air, and they’ll run darn near indefinitely, maintenance free. What could be easier? Most electrical and electronic components have a rated maximum operating temperature of 104°F (40°C). Maintaining the air temperature at a reasonable level less than that is all you need…any lower, and you’re just wasting energy, no matter what method of cooling you use. Our Thermostats are preset at 95°F (35°C) to ensure heat protection, while limiting operating costs. There is such as thing as “too cold.” Particularly sensitive instrumentation & controls may exhibit varied behavior at different temperatures. Our bimetallic probe-type thermostats are ideal for controlling air temperature. They have much faster response time than other mechanical styles, meaning the system won’t keep running once it’s cool enough, and it starts running as soon as it starts getting too hot. They’re also easy to reset, if the preset of 95°F (35°C) is not suitable for particular specific needs. If constant monitoring, or frequent changes in control temperature are desired, the ETC Electronic Temperature Control offers these benefits, via a quick response thermocouple and pushbutton operation. NEMA 12 Cabinet Cooler Systems are oil tight, dust tight, and rated for indoor duty. NEMA 4 systems provide the same protection as NEMA 12, and are additionally splash resistant, and are rated for indoor/outdoor duty. NEMA 4x systems offer NEMA 4 protection, and are made of stainless steel for corrosion resistance. HazLoc Cabinet Coolers are UL Classified & CE Compliant. Unlike refrigerant-based systems, there are no filters to clean, no coils to foul or corrode, and no electric motors to burn out. No potential contaminants from outside air ever enter the enclosure…all the cold air comes from your compressed air supply, through an Automatic Drain Filter Separator fitted with a 5 micron particulate element and a centrifugal separator for moisture removal. 5. Selection: Cooling capacities range from 275 Btu/hr to 5,600 Btu/hr, and they’re all in stock, ready for immediate shipment. This NEMA 4 Dual Cabinet Cooler System protects a critical equipment panel on a hot roll steel line. Continuous Operation Systems aren’t the only way to constantly keep environmental contaminants out…Non-Hazardous Purge (NHP) systems combine the efficiency of Thermostat Control by always passing a small amount of air flow, to provide a slight positive pressure, even when the temperature is lower than the Thermostat set point. This way, the Cabinet Cooler System only operates to maintain appropriate cooling, but the panel is still protected all the time. When additional protection from harsh and corrosive environments is needed, or when specified by strict facility requirements (I’m looking at you, Food, Pharma, and Nuclear Plants,) our NEMA 4X Cabinet Cooler Systems can be provided in Type 316 Stainless Steel construction, from stock. They install, in minutes, through a standard knockout in the top of your enclosure. Side Mount Kits maintain NEMA 4/4X Splash Resistance. If there’s no room on top, or if it’s just more practical, you can put them on the side of the panel using a Side Mount Kit. Don’t know which one to pick, or need help determining your heat load? Then use our Cabinet Cooler System Sizing Guide. There’s one in the catalog that you can fill out and fax or email to us, or you can find it on our website under the “Features” tab on any Cabinet Cooler product page…just fill in the blanks and click “Submit.” Or, you can always simply call in the data to an Application Engineer. We can calculate your heat load in just a minute or so, and we do it over the phone all the time. If you’d like to find out more about heat protection for your electrical or electronic panels, give me a call. Opening Day in Cincinnati Means Summer is Fast Approaching! The first day of spring “officially” started on March 20th this year. I place the word officially in quotations as I don’t recognize spring until I can come home from work, flip on the TV and watch a Cincinnati Reds game. THAT is when spring starts in my mind, yesterday was that day. If you’re from Cincinnati, I don’t need to tell you how important Opening Day is here. As home to the first professional Major League Baseball team, we take great pride in our Cincinnati Reds here. Despite the recent spat of losing seasons…. So much so that Red’s Opening Day has become a de facto holiday of sorts. In fact, many schools will even recognize an excused absence for students that take the day off to go down for the game and festivities prior to the first pitch. There’s even a parade!! With spring upon us, that means summer is right around the corner. While this is an exciting event for most of us, your maintenance manager may beg to differ. Increased temperatures lead to heat related problems in your electrical panels. With summer coming along before you know it, the time is now to get a solution in place before it becomes an issue. EXAIR’s Cabinet Cooler Systems were designed specifically to rectify these issues within your facility. Utilizing Vortex Tube technology, the Cabinet Cooler produces cold air from an ordinary supply of compressed air. This cold air keeps the enclosure free of debris and moisture and is easily installed in minutes through a standard electrical knockout. Here is a short video that shows just how simple it really is. The Cabinet Cooler Systems are available with Nema 12 (IP54) ratings and are also available in Aluminum, 303 Stainless Steel, and 316 Stainless Steel construction for Nema 4/4X (IP66) rated enclosures. For systems that are not able to be mounted on top of the cabinet, we also have Side Mount Kits available in Aluminum, 303 Stainless, and 316 Stainless. This year, EXAIR also introduced a new line of Hazardous Location Cabinet Coolers for use in classified areas. These systems are available with cooling capacities of anywhere from 275-5,600 Btu/hr. To make things much easier for you, we offer a Cabinet Cooler Sizing Guide that will allow us to recommend the most suitable model for your cabinet. With a few quick measurements, we’ll be able to determine the exact heat load that we’ll need to dissipate and offer you a quick and easy solution. If you experienced heat related issues on electrical panels last year, contact an Application Engineer today and we’ll see to it that this summer your cabinets remain cool! Per the National Electrical Code (NEC) there are (3) classifications for areas that are defined as hazardous. They are Class I (gases & vapors), Class II (flammable dusts) & Class III (fibers), the focus of today’s Blog is on Class II locations. Class II locations are those that are hazardous because of the presence of combustible dust. Note that the dust must be present in sufficient quantities for a fire or explosion hazard to exist. The fact that there is some combustible dust present does not mean a Class II hazardous location exists. Dust is defined as a combustible material that must exist as a finely divided solid of 420 microns (0.420 mm) or less. This will allow the dust to pass through a No. 40 sieve. Just as in Class I, Division 1 and 2, the subdivision of Class II into Divisions 1 and 2 identifies the likelihood that there is an explosion hazard. Division 1 locations are defined as an area where the amount of combustible dust is either suspended in the air or accumulated on surfaces in a sufficient concentration to allow for ignition. The ignition could be caused by a failure or malfunction of the equipment in the classified area. Group E & F dust (see chart below) are considered conductive and could penetrate into electrical equipment such as electric motors, control panels, electrical panels, etc.. and cause an electrical failure. Group E dusts are metal dusts, such as aluminum and magnesium. In addition to being highly abrasive, and likely to cause overheating of motor bearings if it gets into them. Group E dusts are also electrically conductive and if they are allowed to enter an enclosure can cause an electrical failure. Group F dusts are carbonaceous, the primary dust in this group is coal dust. Coal dust has a lower ignition temperatures than those in Group E. While Group F dust has a higher thermal insulating value than the layer of Group E. Therefore Group F requires more control of the temperature on the surfaces that the dust settles on. Group E dusts are semi-conductive, however if the voltages are 600 volts or less it is not generally considered a factor. Group G dusts include plastic dusts, most chemical dusts and food-grain dusts. They are not electrically conductive. Generally these dusts have the highest thermal insulating characteristics and the lowest ignition temperatures. Therefore the equipment used in Group G areas must have the lowest surface temperatures to prevent ignition of a layer. Lastly, equipment rated for use in Classified Environments have a rating called the Temperature Code or “T-Code”. This is the temperature or temperature range that the rated device will operate normally and/or in a failed or failing state. Consider something as common as a light fixture, electric motors, etc.. as they could become hot enough to cause ignition depending on the type of dust in the area. So be sure to check the “T-Codes” for every piece of equipment that will be used within a Classified Environments. When you are looking for expert advice on Hazardous Location Cabinet Coolers or safe, quiet and efficient point of use compressed air products give us a call. We would enjoy hearing from you. The National Electrical Code, or NEC, classifies hazardous areas into three different categories; Class I, Class II, and Class III. To use equipment in or around these types of areas, caution has to be taken in order to not cause an explosion or fire. In the U.S., the Underwriter’s Laboratory, UL, can certify products that can be used safely in these hazardous areas. EXAIR received our UL Classification for our new product line; the HazLoc Cabinet Cooler Systems. Under certain guidelines, the HazLoc Cabinet Coolers can be used in Class I for gases and vapors, Class II for flammable dust, and Class III for ignitable fibers and flyings. In this blog, I will be discussing the Class III classified area. For a fire or an explosion to occur, we need three things as described in the fire triangle; oxygen, fuel, and an ignition source. For Class III areas, that fuel is a build-up of material like fabric lint and fine wood shavings. These small fibers can float and collect on equipment in the surrounding areas. This collection of material can easily ignite and cause a fire from a spark or a heat source, like kindling. These fibrous materials and flyings are not explosive, but as a collection, they are a fire hazard; the reason for the Class III designation. This newest hazardous classification is generally located within the textile and woodworking industries. The ignition source (the second leg of the fire triangle) is generally from electrical equipment, heat, and static. 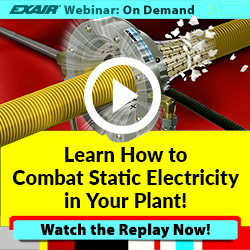 Arcs and sparks from motors, contactors, and switches can easily ignite Class III materials; as well as high temperatures from equipment. NEC and UL segregate this hazardous location into two divisions. Class III Division 1 is in an area where fibers/flyings are handled, manufactured, or used. Class III Division 2 is where the fibers/flyings are stored or handled other than in the process of manufacturing. In both divisions, it is important to protect your electrical systems from these small fibers floating in the surrounding air. The EXAIR HazLoc Cabinet Cooler Systems are designed to keep your electrical panels cool within hazardous areas like Class III because system shutdowns from electrical overheating are costly and potentially dangerous. If you would like to discuss the details about the EXAIR HazLoc Cabinet Coolers, an Application Engineer at EXAIR will be happy to help you. EXAIR is always focused on releasing new products and improving on existing product lines, and 2018 has been no different! Earlier on this year we introduced the New Super Air Scraper as an accessory to our 2” Flat Nozzles and Safety Air Guns. Just last month, EXAIR has also introduced a new line of products to the Cabinet Cooler family: The Hazardous Location Cabinet Cooler. Class I Areas refer to the presence of flammable gases or vapors in quantities sufficient to produce explosive or ignitable mixtures. Class I Div 1 will have ignitable concentrations of flammable gases present during the course of normal operations. This is level of approval is one that differentiates the EXAIR Hazardous Location Cabinet Coolers from much of the competition. Class 1 Div 2 areas will have flammable gasses or vapors present only in the event of an accident or during unusual operating conditions. Class II areas are locations in which combustible dust may exist. The end user shall avoid installation of the device in a Class II environment where dust may be readily disturbed from the exhausts of the Hazardous Location Cabinet Cooler. Any dust formed in the vicinity of the cooler must be cleaned regularly. Class III areas are locations that will have ignitable fibers or flyings present. This is common within the textile industry. The Cabinet Cooler also carries a temperature rating of T3C, meaning it cannot be installed near any materials that could auto-ignite at temperatures in excess of 320°F. 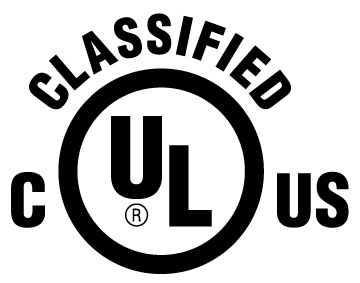 For a comprehensive list and description of all of the various Classified areas, check out the UL website. The Hazardous Location Cabinet Cooler is available in (8) different cooling capacities ranging from 1,000 Btu/hr – 5,600 Btu/hr. The Cabinet Cooler is the best solution for protecting your sensitive electronics from heat, dirt, and moisture. With Nema 4/4X systems available, the Hazardous Location Cabinet Coolers will keep the cabinet cool without compromising the integrity of the enclosure. If you’ve got an electrical cabinet installed within a hazardous location, fill out the Cabinet Cooler Sizing Guide and allow an EXAIR Application Engineer to determine the most suitable model for you. Recently I’ve worked with a customer who needed to troubleshoot some of his Nema 12 Cabinet Coolers installed in their plant. They’ve been installed for about 6 years now without issue, but over the summer they noticed a few times where the temperatures inside the enclosures was getting a bit higher than they were comfortable with. Since this hadn’t been an issue since prior to installation, they gave us a call to see what could be the problem. They had (6) total Cabinet Coolers, (2) of the 4340s and (4) 4325s all being fed from the same compressor. The first thing we wanted to determine was whether or not a sufficient volume of air was being supplied to them. Since this was a new problem and we had several years of operation without any trouble, there had to be something that has changed. With a pressure gauge installed directly at the inlet, he observed that the pressure coming into the Cabinet Cooler was only 70 PSIG. Cabinet Coolers are rated at pressures of 100 PSIG but can operate in the range of 80-100 PSIG, so we knew then that not enough air was reaching them. When troubleshooting any Intelligent Compressed Air Product, we need to know the pressure DIRECTLY at the air inlet to the product. Oftentimes a customer will know the pressure they’re getting out of the compressor, but this isn’t generally the pressure you’ll see at the point of use. Pressure drops can occur due to undersized lines, restrictive fittings (such as quick disconnects), or improper maintenance. He shared with me some photos of the setup and said that they hadn’t changed anything since the original installation. These units were operating off of their own dedicated compressor, so we weren’t getting a pressure drop due to any additional applications also using the same air supply. With no moving parts to wear out the Cabinet Coolers are a maintenance-free product, so long as they’re supplied with clean and dry compressed air. In order to ensure that the air supply stays clean and dry, an Auto-Drain Filter should be installed just upstream of the Cabinet Cooler. Inside of any of EXAIR’s Auto-Drain Filters is a 5-micron filter element. If this becomes clogged over time, it can result in a pressure drop just after the filter. This turned out to be the culprit in this case as he placed an order for some replacement filter elements, changed them out, and was back up and running! The pressure at the Cabinet Coolers increased to 90 PSIG and started operating as they had before. 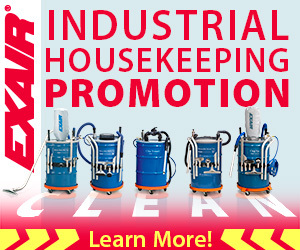 EXAIR prides ourselves in delivering a quality product that’s Built to Last. If you have a product that doesn’t seem to be operating at peak performance, give us a call. An Application Engineer is ready to take your call and help make sure you’re getting the most out of our products. Recent blog discussions about the EXAIR Cabinet Cooler Systems have covered many topics including correctly sizing one, the NEMA ratings, and how-they-work. In this blog I will review three special options that are available for the most extreme environmental conditions- high temperatures, dirty environments, and harsh or corrosive areas. High Temperature – For enclosures that reside in high temperature ambient conditions such as near furnaces, boilers, or ovens, EXAIR offers a High Temp version, with special internal components designed to withstand the elevated temperatures. Cabinets near sources of high heat certainly need to be kept cool, and the EXAIR High Temperature Cabinet Cooler is specially suited to for use in these locations. Non-Hazardous Purge (NHP) – Cabinet Cooler Systems with this feature provide a continuous positive purge within the enclosure to prevent contaminants from entering through small holes or conduits. Especially suited for dirty and dusty environments, the NHP Cabinet Cooler Systems provide a slight positive pressure inside the enclosure. This is done by passing 1 SCFM (28 SLPM) of air through the cooler when the the solenoid is in the closed position. When the thermostat reaches the set-point temperature and energizes the solenoid, the full line pressure of air is delivered to the Cabinet Cooler providing the full cooling capability, and still keeping the positive pressure. When the internal temperature cools to the set-point, the solenoid closes and the system returns to the 1 SCFM (28 SLPM) of air flow condition. Type 316 Stainless Steel NEMA 4X Cabinet Coolers – For enclosures that are in food service, pharmaceutical, harsh, and/or corrosive environments, and any application where 316 stainless steel is preferred, the Cabinet Coolers are available in the Type 316 stainless material. The systems are UL Listed for wash down environments, ensuring the enclosure electrical contents remain cool and dry under any condition. Noted applications include on ocean going ships, power plants, medical device manufacturing facilities, and bakeries. Please note that the High Temperature, Non-Hazardous Purge and Type 316 Stainless Steel Cabinet Coolers are each available from stock! No waiting for these special models. To discuss your application and how a Cabinet Cooler System or any EXAIR Intelligent Compressed Air Product can improve your process, feel free to contact EXAIR, myself, or one of our other Application Engineers. We can help you determine the best solution!